It feels completely appropriate that my first virginal attempt at blogging would be about CHERRIES. If you made me pick (word-play intended) my favorite fruit it would be the mahogany red, lush, velvet skinned, hard-bodied BING. Ba da bing! Forgetting, yet mentioning, the over-used trick of tying the cherry stem in your mouth as a sign of...what? Amazing tongue strength? I'm not sure. I find the juicy, full fleshed fruit of the cherry much more sensual and full of the possibilities of leaving one tongue-tied than the stem holds. 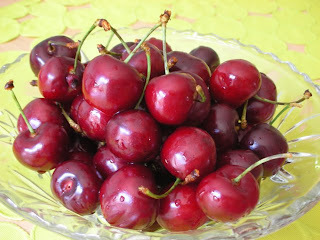 At a recent trip to the Hermosa Beach Farmer's Market I practically ran over to the table with the Bing Cherries. The season for these beauties is short and I felt like I had been waiting so long and patiently for their arrival. It's hard to believe that the United States, and especially California, is responsible for 90% of the commercial cherry crops grown. In our capital, Washington D.C., Japan is responsible for the hundreds of blossoming trees that surround the government buildings. The Sakura trees were a gift of friendship from the people of Japan in 1912. There are so many varieties of cherries that have been developed since the first cultivation around 300BC, and the BING was actually the baby of Seth Luelling of Oregon in 1875. Thanks, Seth, you rock! You would be hard pressed to find a healthier way to "get your taste on" than with cherries, since they are low fat, sodium free, high in fiber, potassium, vitamin C, folic acid and Antioxidants. Whhatt? I'm not kidding, popping cherries (word-play NOT intended) is not only delish', but good for you. Now, what to do with the red orbs besides eating them raw and spitting out the pits? There are pies, tarts, cobblers, jams and granola (all of which are amazing), but I chose to turn them into these little lovelies that resemble the Pate De Fruit of France and the Fruit Paste of Italy. The recipe takes a little watching for perfection, but so worth the time and love. The sugar content helps to preserve the fruit, so these lasts and lasts; although if your friends or family have anything to do with it - they'll be gone in a red cherry flash. Let me know if you try this, find it interesting, or have any questions. Cheers! 300 g. (2 cups) Bing cherries, washed and pitted. 300 g. sugar (1 1/2 cups) + 1 Tbls. Mix the apple pectin with the 1 Tbls. of sugar and set aside. In a heavy saucepan, heat the cherries and the sugar on Med. for about 10 minutes, to break the cherries down a little. Take cherry/sugar mixture off the heat and cool for a few minutes before carefully pouring mixture into a blender or food processor. Pulse cherries until a puree is reached. Pour puree back into the same saucepan and heat on high to just before boiling. Add the apple pectin/sugar mixture, stirring constantly. Bring mixture to a boil and add the Corn Syrup and the lemon juice, stirring constantly until mixture reaches 222F, and is thick. Immediately, pour mixture into the prepared 8x8 pan. Let cool for 2-3 hours until firm. Turn out onto a cutting board and cut into 1 inch squares (or use other shapes). 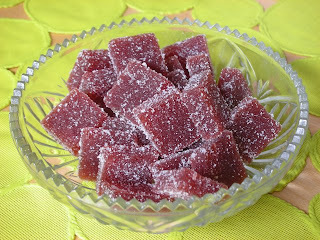 Drop a few at a time into a bowl of sugar and toss to coat. Shake off excess sugar and keep in a tightly sealed container in a dry, cool place. Do not put in refrigerator as the moisture will make the candy sticky. Enjoy! I love cherries and I never thought they were good for me. I always figured if it tastes that good it must be wrong. I love cherry pie! I love knowing that the Japanese gave us those beautiful trees and the French gave us that beautiful statue. So much love surrounds us. Look forward to the recipe. mmmmmmmmmmmmmmmmmm.....must have this, cherries are my favorite. If I substitute the bing for frozen morello cherries instead is there any changes to the recipe above?